MRPL manufactures varieties of Refractories shapes which are difficult and/or impossible to make through Pressing route. Products of these kinds of ranges are of complex and complicated shapes embedded with Metal Anchors or Frames. MRPL has its own Central Workshop for Mould making (both Metallic and Wooden Patterns) for fabrication of Precast Items with assured product qualities in terms of shapes, sizes, dimensional accuracy and surface finish. 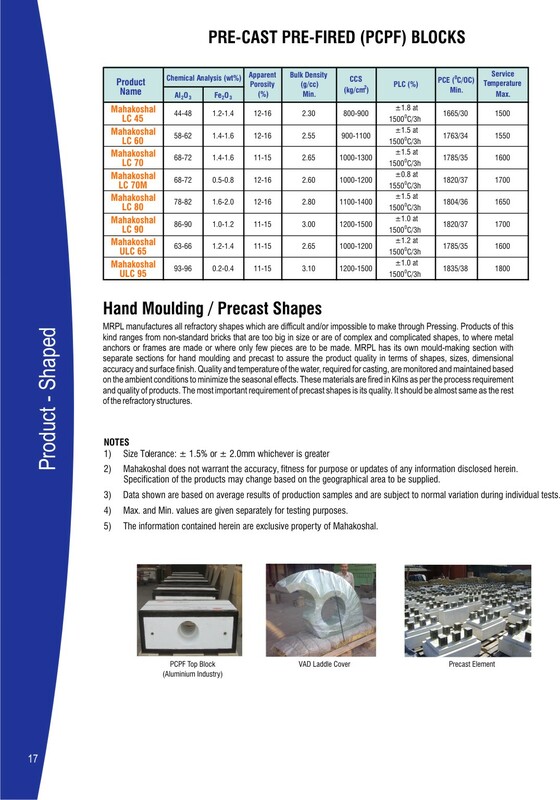 PCPF shapes of very big sizes like Ladle Cover for VAD; Top Blocks for ABF; Ceramic Anchor embedded Precast Element for Roof of Reheating Furnace etc. are casted in the designated area with all necessary arrangement for proper handling of heavy items mechanically. Quality and temperature of Water, required for casting, are monitored and maintained based on the ambient conditions to minimize the seasonal effects. These materials are fired in specially designed Kiln as per the process requirement and quality of the products. The most important requirement of Precast shapes is its quality; which should be almost same with rest of the refractory structures. Mahakoshal LC 45 44-48 1.2-1.4 12-16 2.30 800-900 ±1.8 at 15000C/3h 1665/30 1500 Aluminium Industry for Burner Block Sealing; Top Block in ABF and others.